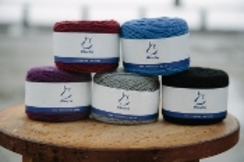 Until we get enough fiber from our yaks to make yarn, we are carrying the Rocking Yarn line of yarns. Made from 100% Tibetan Yak Down fiber hand-spun into yarn with drop spindles by rural Tibetan women living on the Tibetan plateau. Warm, breathable, luxuriously soft and hypoallergenic. Your purchase helps support these women and their communities.